Cats hate dogs and dogs hate cats — right? Well, this is not always the case. These, traditional mortal enemies, can actually get along pretty well. I am often asked about bringing a dog into a home with an existing cat or vice versa. 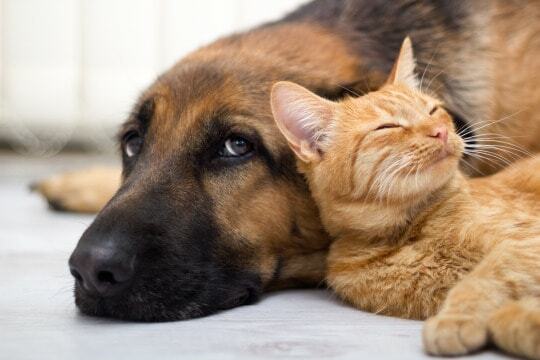 This is a source of concern for many people who would like to have cats and dogs living together. Recently, I met a family who had two young, fairly large, lively dogs. They lived on a farm with some kittens who were semi-feral and had been expected to live in the barn while earning their keep as ratters. In this case, the kittens had other ideas, it was far nicer indoors than in the barn. They were now, regularly making themselves at home in the house. One of the dogs showed zero interest in the kittens, the other was unsure of how to react and had chased them a couple times. The family asked for my help with the situation. The key to success is to gradually introduce the new pets. Clearly, common sense dictates that the pets should be kept separate whilst not under supervision, certainly while they are getting used to each other. Your existing pet will already have areas in the house that it considers to be of high value. Suddenly allowing a new addition access to these areas is a recipe for problems. It is important to understand that introducing a new pet, in this case a number of kittens, into a household is a significant change to the social structure in the eyes of your dog. The dogs were allowed to be in proximity of the cats in a controlled manner. This allowed them to become more relaxed and accepting of the new housemates. This type of thing should be done carefully, under the guidance of a trained behaviourist. So, don’t be put off from introducing different species to each other, just make sure you do it with professional guidance.